Visitors to the Washougal Mill store are invited to take a free tour of the mill. Here you can see the process firsthand from our state-of-the-art dye house, through spinning and weaving, to the finishing of our distinctive blankets. 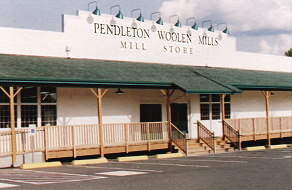 When you're finished you can visit our Mill Store pictured to the left where you can select from Pendleton's array of menswear, womenswear, blankets and fabrics. Public tours for individuals and small groups (under 10 persons) are held Monday through Friday, at 9 am, 10, am 11am, and 1:30 pm. Reservations are not required, however tour spaces are filled on a first come basis. When necessary, extra tours may be added to the existing tour schedule if sufficient tour staff is available. Tours take about 45 minutes. To place a tour reservation call the Washougal Mill Store at 360-835-1118. * Please Note - The Washougal Mill closes for 2 weeks in December and 2 weeks in August, please call ahead for tours. 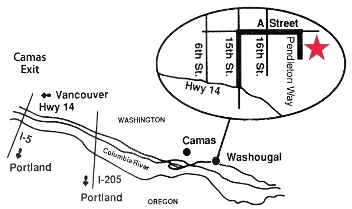 From Portland, OR take I-5 north, cross the Columbia River and take Route 14 East to Washougal. At 15th Street (now Washougal River Rd), turn left. As you turn, on the right, you will see the Pendleton billboard.